The Lake District is the biggest and most visited National Park in England. It was established in 1951 and boasts magnificent scenery including the country’s highest mountain, Scafell Pike, and the biggest and deepest lakes, Windermere and Wast Water respectively. Approximately 42,000 people live within the 880 square miles of the Lake District National Park. Major settlements within the park are the towns of Windermere, Keswick, Ambleside, and Bowness. Towns just outside the boundary include Penrith, Kendal, and Grange-over-Sands. The majority of the land within the park is privately owned. Most of the rest is owned by the National Trust (25%), United Utilities (7%), the Forestry Commission (6%) and the Lake District National Park Authority (4%). Approximately 16 million tourists visit the Lake District every year. Most come in July and August and hotel rates can be high during this time. Bank holidays, Easter and Christmas are also popular. Bowness is particularly busy during these times. Of all the lakes in the Lake District only Bassenthwaite Lake is called by that name. The rest are meres or waters. Lakes and reservoirs include Bassenthwaite Lake, Brothers Water, Coniston Water, Crummock Water, Derwent Water, Elter Water, Ennerdale Water, Esthwaite Water, Grasmere, Haweswater, Loweswater, Rydal Water, Thirlmere, Ullswater, Wast Water, and Windermere. Passenger ferries operate on four of the lakes in the Lake District. The busiest operator is Windermere Lake Cruises. Services run between Bowness, Waterhead near Ambleside, and Lakeside. Other operators are the Coniston Launch and Steam Yacht Gondola on Coniston Water, the Keswick Launch on Derwent Water, and Ullswater Steamers. Using the Nuttalls system of classifying mountains, the Lake District boasts the ten highest peaks in England. They are Scafell Pike, Sca Fell, Symonds Knott, Helvellyn, Ill Crag, Broad Crag, Skiddaw, Helvellyn Lower Man, Great End and Bowfell. In the final volume of the Pictorial Guide to the Lakeland Fells influential hill walker Alfred Wainwright named his six best fells as Scafell Pike, Bowfell, Pillar, Great Gable, Blencathra, and Crinkle Crags. The Lake District is famous for its strong literary connections. William Wordsworth was born in Cockermouth and went to school in Hawkshead. Two of his houses, Dove Cottage and Rydal Mount, are now open to the public and his grave can be seen at St Oswald’s Church in Grasmere. Beatrix Potter also made a significant impact on the Lake District. She developed a love for the area while holidaying as a child and later moved to the area after marrying William Heelis, a solicitor based in Hawkshead. She was instrumental in founding the National Trust and bequeathed much of her extensive estate to the organisation when she died. The legacy included the Monk Coniston estate (and the beautiful Tarn Hows) and Hill Top, her artistic retreat at Near Sawrey. The Beatrix Potter Gallery in Hawkshead and the Armitt in Ambleside now house many of her original drawings and illustrations. Children can see Potter’s stories brought to life at the World of Beatrix Potter attraction in Bowness. Other attractions in the Lake District suitable for children include Trotters World of Animals, the Lakes Aquarium, the Lakeside and Haverthwaite Railway, the Ravenglass and Eskdale Railway, Fell Foot Park, and the Go Ape adventure courses at Grizedale Forest and Whinlatter Forest Park. Annual events in the Lake District include the Keswick Film Festival (February), the Keswick Jazz Festival (May – Theatre by the Lake), the Keswick Mountain Festival (May), the Keswick Beer Festival (June), the Windermere Air Festival (July), Ambleside Sports (July), Grasmere Sports and Show (August), and the Hawkshead Show (August). More information about attractions and events can be obtained from Brockhole, the main visitor centre of the Lake District National Park Authority. Housed in a Victorian mansion overlooking Windermere, it also offers a wide range of attractions and activities for both adults and children. Other tourist information centres in the area can be found in Ambleside (Market Cross), Bowness (Glebe Road), Ullswater, Keswick (Moot Hall, Market Square), Coniston, and Windermere (Victoria Street). The M6 motorway lies to the east of the Lake District National Park. The best point of exit depends on the destination and the direction of approach. For the northern end of the Lake District leave the motorway at Junction 40 and then take the A66 for Keswick / Bassenthwaite Lake / Derwent Water, or the A66 / A592 for Pooley Bridge / Ullswater / Glenridding. To reach the southern end of the Lake District, drivers coming from the south should exit at Junction 36 and then take the A590 / A591 for Windermere / Bowness / Ambleside / Rydal Water / Grasmere, the A590 / A591 / A5095 / A593 for Coniston, the A590 / A591 / A5095 / A593 / B5286 / B5285 for Hawkshead, or the A590 for Newby Bridge / Lakeside. Drivers approaching from the north should exit at Junction 40 and take the A66 / B5322 / A591 for Grasmere / Rydal Water / Ambleside, the A66 / A592 for Windermere / Bowness / Lakeside / Newby Bridge, the A66 / A592 / A591 / A5095 / A593 for Coniston, or the A66 / A592 / A591 / A5095 / A593 / B5286 / B5285 for Hawkshead. The A592 runs from Penrith to Newby Bridge, passing Pooley Bridge, Ullswater, Aira Force, Glenridding, Windermere, Bowness, and Fell Foot Park. It is widely regarded as one of the most scenic roads in England. It includes the Kirkstone Pass, the Lake District’s highest road and home of the Kirkstone Pass Inn, the third highest pub in England. Cumbria County Council runs a passenger and car ferry across Windermere, from Ferry Nab (just off the A592 near Bowness) on the eastern shore to Ferry House (near Far Sawrey) on the western shore. Drivers leaving the M6 motorway at Junction 40 can take a break at Rheged. It offers a good selection of restaurants, shops, a petrol station, and even a giant IMAX cinema. Other places to stop en-route to the Lake District are the Tebay Services near Junction 38, the only family-owned motorway services in the UK, and Carnforth Station near Junction 35, the setting for the classic film Brief Encounter. National Express runs a daily coach service from London (Victoria Coach Station) to Whitehaven in Cumbria. Stops include Birmingham, Wigan, Preston, Lancaster, Morecambe, Carnforth, Kendal, Windermere, Ambleside, Grasmere, Keswick, Cockermouth, and Workington. Windermere trail station is the only passenger railway station within the borders of the Lake District National Park. Direct trains to Windermere include the First TransPennine Express service from Manchester Airport (via Manchester Piccadilly, Manchester Oxford Road, Bolton, Preston, Lancaster, Oxenholme, Kendal, Burneside, and Staveley) and the First TransPennine Express train from Oxenholme to Windermere (via Kendal, Burneside, and Staveley). Many passengers find it convenient to change at Oxenholme (on the West Coast Mainline) and take one of the trains noted above to Windermere. Direct services to Oxenholme include Virgin Trains services between Scotland and London / Birmingham and First TransPennine Express services between Scotland and Manchester Airport. 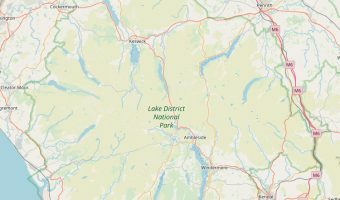 Penrith train station is outside the boundary of the Lake District National Park but is the most convenient for those going to Ullswater and Pooley Bridge. It also lies on the West Coast Mainline and is served by Virgin Trains services between Scotland and London / Birmingham First TransPennine Express trains from Scotland to Manchester Airport. Passengers coming from Yorkshire can take a scenic rail journey on the Settle to Carlisle Railway, and from Carlisle take one of the southbound services to Oxenholme (e.g. Virgin Trains service to London), and then another train to Windermere.